Durban’s beachfront promenade isn’t new, but it’s perpetually reinventing itself. The promenade was extended north all the way to Blue Lagoon to connect with Riverside along the Umgeni River. 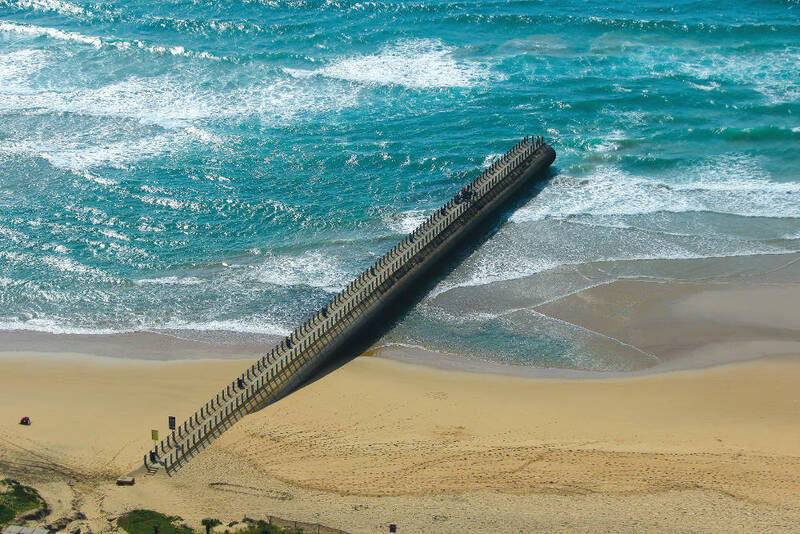 Currently, it’s heading south – then west – from uShaka and the Point development, along the harbour mouth to connect with the Esplanade. Eventually, walkers and cyclists will have an endless, wonderfully paved, safe and secure waterside promenade stretching for kilometres, with harbour, sea and river vistas. Little doubt that the promenade has affected – and elevated – every aspect of life on the Golden Mile, from property values to tourism. 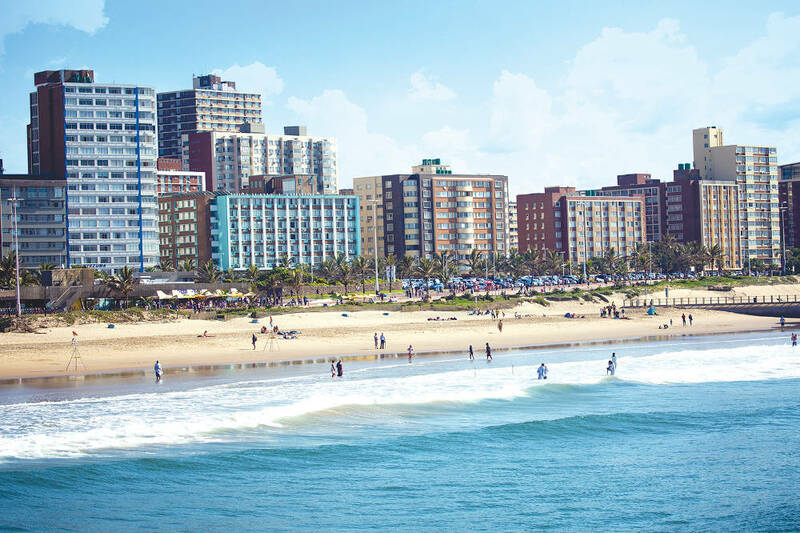 Durban is increasingly popular as a local tourist destination, and the Golden Mile’s hotels and beaches are the drawcard. 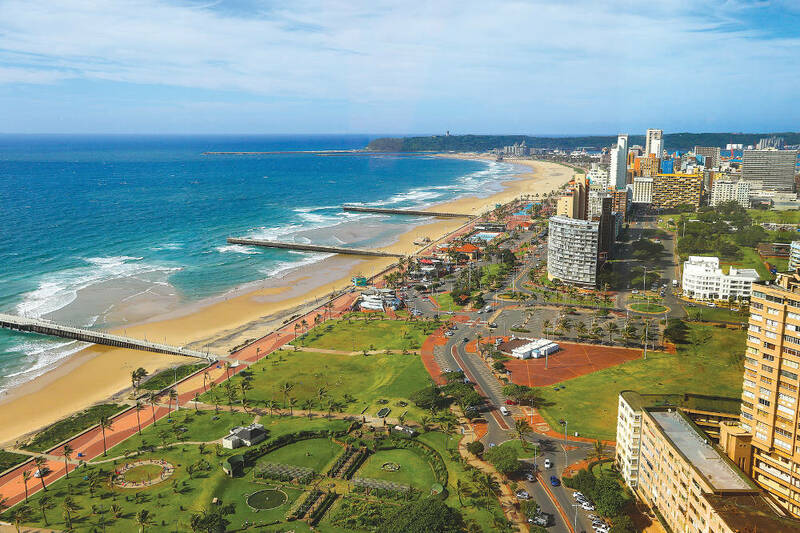 There’s a strong drive in KwaZulu-Natal for tourism-related development, with R39bn worth of developments queuing up, the largest slice of the pie being the Durban Point precinct development, currently underway with the R300m promenade development. The final product will include everything from hotels, office parks, retail, residential… and a new cruise ship terminal, valued at R215m. 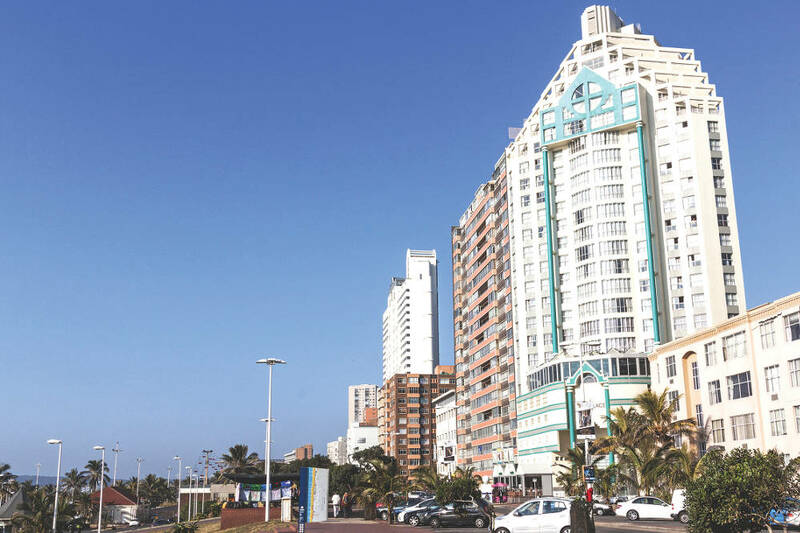 On the northern side of the Golden Mile, Tsogo Sun’s latest investment in Durban is a complete redevelopment of Suncoast Hotel and Casino at a cost of R1,6bn, destined to be completed by the close of 2018. It includes an additional 8,000m2 of space, a newly located Salon Privé with sea views, eight new restaurants, retail outlets, casino space, parking, a Barnyard Theatre, and a multipurpose event venue for up to 2,000 people. From one end of the Golden Mile to the other, towering blocks of apartments sit cheek by jowl with beachfront hotels. Behind the frontline, there’s another row of apartment blocks, but frontline is prized, because the views are unsurpassable, and the beach and promenade are literally on your doorstep. 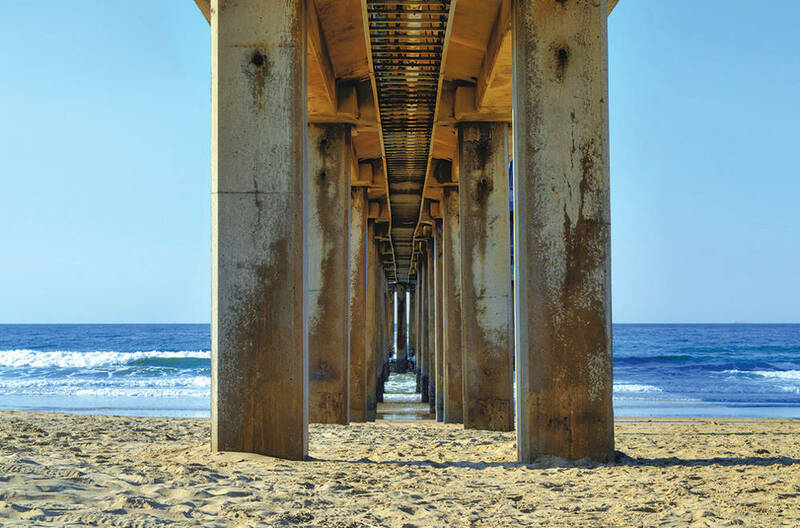 Beachfront property has always been a combination of sectional title and shareblock, with shareblock being the predominant model. Many of these blocks are old, and even if they’ve been upgraded, there’s still a dire shortage of parking. Creative parking schemes abound, but the shortage can be a handbrake for purchasers – there is, of course, ample street parking with security, often outside your window. North Beach is considered the upmarket side of the Golden Mile, and there are some sensational apartments and penthouses. In the boom times, property prices rocketed. 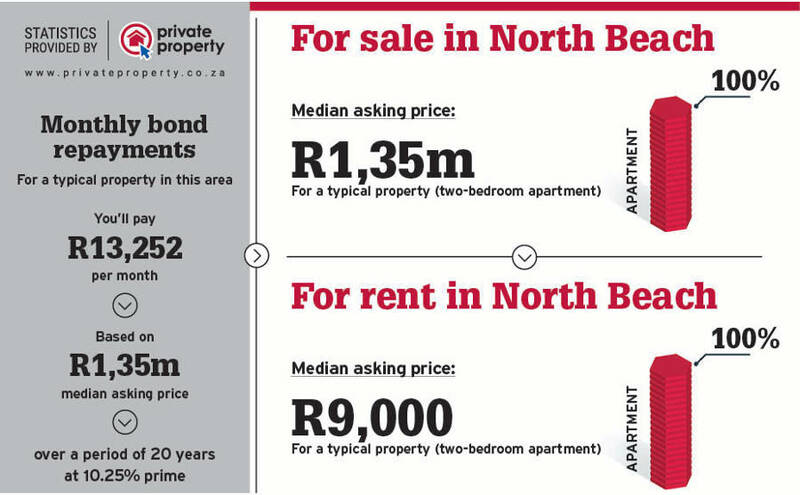 Today, a luxurious 180m2 North Beach share block, three-bedroom, two-bathroom apartment with unimpeded seaviews and a single undercover parking is on the market at R4,999m, while a two-bedroom sectional-title apartment with sea views and single parking to rent, is on the books at R1,5m. Some blocks allow holiday letting, others don’t. There are pros and cons to both, depending on whether you’re an investor or a resident. There are few schools along the Golden Mile, but for those who live permanently along this belt, young children can attend Addington Primary, or move further afield by a couple of kilometres to the suburbs of Glenwood or the Berea, where there are numerous primary and junior schools. The Golden Mile has easy access to surrounding suburbs. For senior and tertiary education, there’s the nearby George Campbell Technical High School, George Campbell School of Technology, or Durban University of Technology. Alternatively, there are Glenwood Boys, Berea Girls, or Durban Preparatory High School or Durban High School. The Golden Mile is praised by local residents as a wonderfully safe, well-run amenity to be enjoyed by everybody. There are a few stand-out eateries and coffee shops along the length of the beachfront, and they’re busy in the early mornings, and ultra-busy on weekends. Night life is largely limited to the hotels, restaurants and bars within them. The main drawcard is clearly the beach, and with shark nets and lifeguards, on a beautiful Durban day it’s the busiest place in town. Whether it’s swimmers, surfers, body boarders, or paddle skiers in the waves, or cyclists, runners, walkers, you name it, on the promenade, there’s more action on the Golden Mile than anywhere else in Durban. On Saturdays, hundreds of walkers and runners join in the Park Run, and on all other days of the week, there are two municipal outdoor gyms which are well used, yoga on the roof of the Circus Circus Cafe, the lifesaver nippers are being taught their thing, and surfing lessons are underway by Expression on the Beach at Addington. From 0 to 100, no matter your age or stage, there’s an activity for all on the Golden Mile. I was recently widowed, but it’s not possible to be lonely when you live down here. There’s always something on the go, easy to meet up with friends, amble along the beachfront, and I never tire of watching the sea.